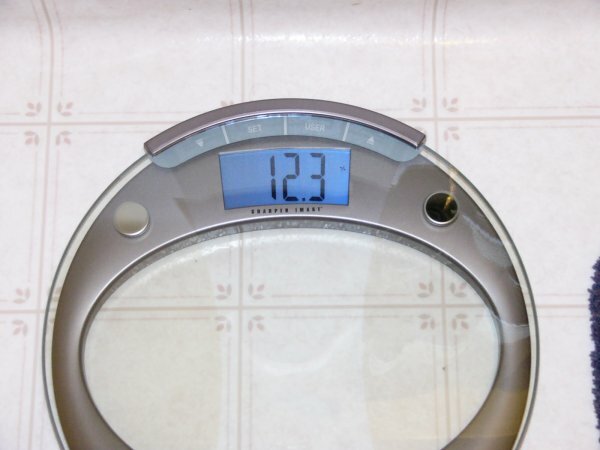 I finally went to Sharper Image and bought their electronic scale + body fat monitor. I hope this scale is accurate. I was about 6 pounds lighter on this thing than when I measured on Peg's scale. Though that extra weight might be attributed to the semi-large dinner I'd just had at her place the day after New Year's. Anyway, it looks like I'm averaging at around 150 lbs. The keys, change, etc. I had in my pants add 3 pounds of extra weight, which also throws off the body fat percentage a bit. I toook a pic earlier for Club3G (there's this thread about posting pics of something only you have in the forum), which measured my body fat percentage at 12.3%. The manual says I'm supposed to measure "first thing in the morning and at the same time each day," so I guess I'll see if the measurement is any different tomorrow morning.